The Columbia Series 950 Pressure Transducers are completely self-contained measuring systems that allow direct readout and recording of pressure surges or blasts without additional signal conditioning equipment. Available in a variety of voltage sensitivities, the device is capable of sensing small dynamic changes in pressure in the frequency range of 5 to 18KHz while withstanding high static pressure. This sensor series is housed in a rugged stainless steel case, mounts via a 1/2" male pipe thread, and incorporates a recessed diaphragm. 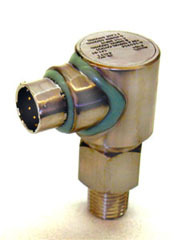 A 6-pin connector provides convenient installation. This design has a long history of successful operation in down-hole oil drilling applications.